Catania Bedda Bed & Breakfast i Catania, Italien: Reservér nu! 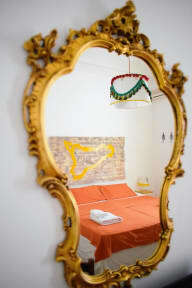 The Bed and Breakfast Catania bedda , on the 3rd floor with lift of a nineteenth-century palace, located opposite the botanical gardens in the Central Via Etnea with its many shops, bars and restaurants. From here you can take a pleasant stroll: the Villa Bellini, the Roman amphitheater and other important archaeological excavations, baroque churches, University square, Piazza Duomo with his elephant and the Massimo Bellini Theatre. 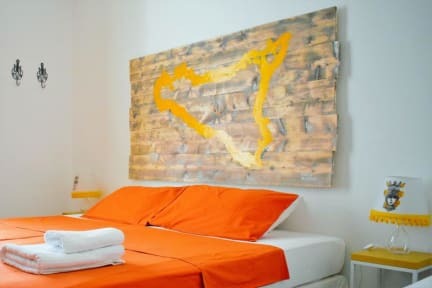 Catania bedda is suitable for tourist trips and/or business, is easily accessible from the airport, the train station and the port with public transport. Simple and comfortable rooms are equipped with:-private bathrooms-WiFi-TV-heating-air conditioning In common areas, breakfast room and terrace, you will feel right at home with friends. Parking in the garage, extra cost.